This weekend we were between houseguests so I thought we would be able to take it easy, I was wrong. On Friday night after supper, E and I went to a little Christmas concert at our church. The junior choir was singing and some students from the Etobicoke School of the Arts played their instruments. It was a nice little evening of some familiar Christmas tunes. On Friday night Dave and I were watching the Raptors game and then a movie. Before the game, Demar Derozan (of the Raptors, for those who don't know) sent out a tweet that said to retweet and reply for a chance to win tickets to the Raptors 905 game on Saturday afternoon (this is the development league team for the Raptors). I retweeted and replied and waited until the Raptors game was over. Then I got a direct message from Demar himself saying I'd won the tickets!! I never win anything, like I can count on one hand the amount of times I've won something like a door prize, 50/50 draw, or other raffle, so I was very excited. On Saturday morning we got up early and did some stuff around the house before E headed to his last day of Sportball. Then Dave and I did some errands up the street. I got some perogies for lunch at one of the Polish places, they are so good! Then we went drove out to the "905" (Mississauga) to see the basketball game. We only had two tickets but we thought we could just buy the third one when we got there. We found out that the seats were actually in a suite and since that was the case, they said E could come in with us without his own ticket, so the three of us headed to the suite. There were four other people in our suite, two who had won the tweet contest and their guests. Next door were some more winners. E was very excited. The last few basketball games we have attended, he hasn't come with us, so he was happy to come with us this time. The Raptors 905 is a great place to bring kids, they don't really care if it's NBA or the D-League and the tickets are cheaper. There are still dancers, a mascot (Stripes, not Raptor), music, and games. We will definitely go back this winter. Demar came up to our suite at half time to say hello and take some photos. He was sitting court side with his wife and daughter for the rest of the game. He was very nice and gave E a high five. Also at the game were Lucas Nogueira, DeMarre Carroll (and wife and child), Bismack Biyombo, and James Johnson (and girlfriend). And of course Bruno Caboclo plays on the 905 team. (I zoomed in so this is blurry, DeMarre is wearing the red sweatsuit, James Johnson is wearing the black hoodie and grey coat, sitting down. We were tired when we got home and fortunately I had bought a meat pie from Max's Market for supper so it was easy. On Sunday morning we had another early morning, Dave went for a long run while E and I got ready for church. We went early to get E's costume for the Christmas pageant. Dave came along after his run. E was to be a shepherd, and although the costume was a little big, and the shepherd staff was a disaster waiting to happen, he did pretty well. He had to act afraid when the angels appeared and then he had to kneel down and worship Jesus in the stable. He followed along with with the older shepherd was doing and did great. After church and lunch we went to Liberty Village to drop E off at a birthday party at Children's Discovery Centre. Dave and I got a coffee at Balzac's and then walked around to look at the furniture stores. It wasn't until it was almost time to go pick up E that we decided to get a drink and snack at Local Public Eatery. This is a new restaurant in the area but it was a cool spot; they even had Dave's favourite game, table shuffleboard. For supper I had made a slow cooker butter chicken. It was so easy and tasty. I will make this again. 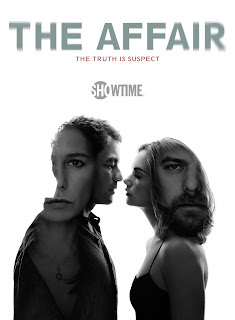 Then we watched the season finale of The Affair. So good!